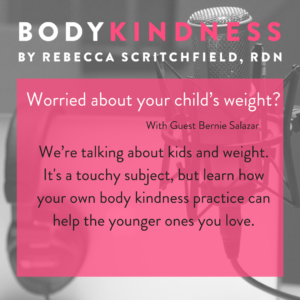 Today we’re talking about kids and weight, and how your body kindness practice can help the younger ones you love and even families that you don’t know. This is a touchy subject to say the least, but there’s been some changes recently that could make an impact on our population’s health. The American Academy of Pediatrics (AAP) have just updated their 2007 Guidelines on prevention of obesity and eating disorders in adolescents. Their new recommendations are dramatically different and make us excited that we could finally start changing the conversation around weight and dieting. Listen on to find out how you can be part of the change. I opened with a story about a friend of mine who was at the doctor’s office with her young son. My friend was shocked when the doctor commented on the son’s weight and poked his belly. What’s scary is that this was an active kid and part of an active family where wellbeing is woven into their values. But the doctor didn’t ask about lifestyle – he just made the judgment. This situation is not uncommon and is reflected in the previous AAP Guidelines. In 2007 it was okay to use the term obesity relating to children despite evidence that the term was more harmful than helpful. It also recommended putting “overweight” kids on commercial weight loss programs, and in some cases even recommended weight loss surgery on growing bodies. Bernie said this was his experience and remembers being offered to go on a popular diet program as a reward for good grades. His parents’ intentions were good and he understands their thinking given the misinformation of the time. I said that as a culture a real shift will happen when we stop seeing bodies as problems and accept size diversity. What we need is more activism around the idea that all bodies should be respected. We have to be very careful with the idea of “healthism” and that you’re only acceptable (the “good fatty”) if you’re working on losing weight. Yes, there are poor choices we can make – smoking, not enough sleep, drinking too much, poor eating and exercise habits. They’re still an individual choices that both fat and thin make, but fat people get the vitriol for it. You can’t tell how healthy and unhealthy people are just by looking at them, yet we make judgements. I encouraged everyone to be aware of your own bias and culturally ingrained belief – challenge them! We talked about the dramatic shifts in the 2016 AAP guidelines. Until now dieting has been presented to the medical community as the solution to childhood obesity. But dieting leads to weight cycling, obesity and/or eating disorders. Fifty years of research show that eating disorders are the most deadly mental illness. I asked how we can be so accepting of dieting when the evidence shows it leads to eating disorders and depression, is associated with bullying and even suicide in children. That’s why it’s so important that these guidelines are finally going in the right direction. Bernie says he’s glad this change in conversation is happening. He recalled his childhood confusion at the mixed messages he received, on one hand being called chubby by well-meaning family members yet constantly fed by them. I said that all of us, not just doctors and parents, need to stop the mixed messages. Body image issues are associated with both obesity and eating disorders so we need to promote positive body image at home and work on our own. The new guidelines acknowledge that dieting, weight talk and weight teasing are harmful and associated with obesity and eating disorders. Here’s some statistics to get the alarm bells ringing: the AAP also found that dieting behaviors were associated with a two-fold increase in risk of being overweight and 1.5 fold increase in incidence of binge eating. Parents who talked about weight had adolescents who were more likely to engage in dieting, unhealthy weight control behaviors and binge eating. We need to be careful about how we talk about weight around children. The solution is not to not talk about it – but rather teaching them about size diversity. I believe we should not weigh children unless there are real medical reasons. If you have concerns, make the conversation about habits and feeling good, not about weight and numbers. The new guidelines discourage physicians from talking about weight with their patients but instead encourage focus on behaviors. We can have a collective duh moment, but this is a great change. Bernie feels the guidelines are putting the ball in the court of parents – children do what we do, not what we say. He’s thinking about how to change the fabric of his family to healthy habits are fun and part of who they are. I said that as parents, our kids need us to be the calm and confident ones. Even if we’re still working on our own issues, we need to be positive and embrace uncertainty as we support our children. If we can embrace size diversity accept there will always be bigger kids, we can accept that it’s really about well being and feeling good about our habits. If you’re not feeling good about your habits, that’s the work. 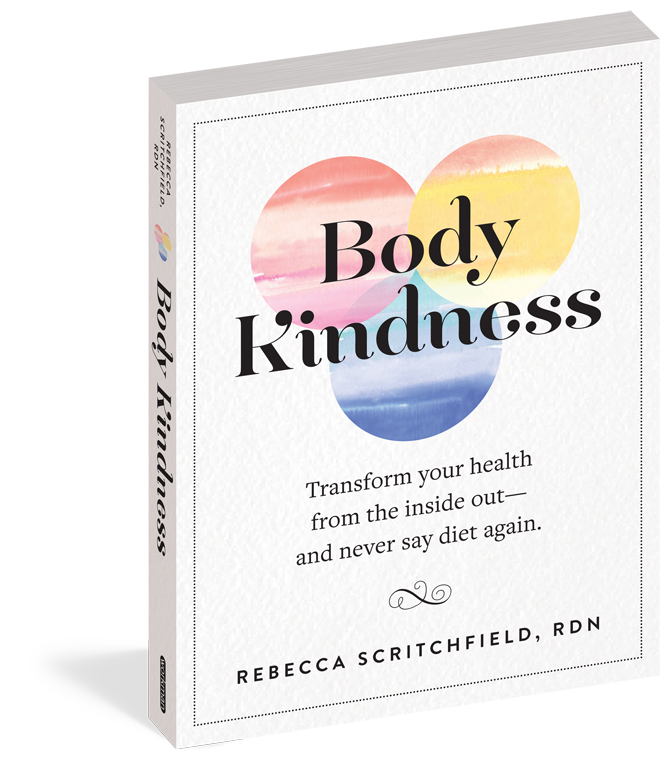 How you get there is through the practice of body kindness – not dieting or weight bashing. I asked Bernie what he would say if his daughter was twelve years old and started talking negatively about her body? He said he’d have an open and honest conversation that acknowledged her reality while talking about all the positive things her body can do. I add that I’d ask lots of questions to bring the conversation back to habits and wellbeing outside of appearance. She may be talking about weight and appearance but may mean that she’s disappointed with her self care in some way. Let her see that you’re her ally. My advice to parents worried about their kids weight. The American Academy of Pediatrics latest guidelines for preventing obesity and eating disorders in adolescents. 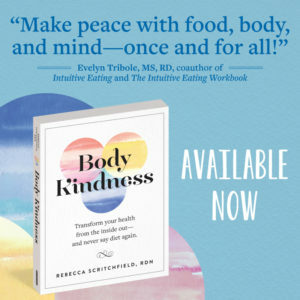 Evelyn’s article dieting leads to weight gain. My favorite handbook for professional to help people change through motivational interviewing.